Back to School proves a great time to construct ways to get organized and stay that way! It’s been a long, hot summer filled with a fresh crop of family memories of sun-soaked days and star-filled nights. For some parents, it’s also been a compilation of weeks marked by wet-bathing-suit-strewn floors and stubbing-toes-on-toys-injuries. Once the kids climb aboard that school bus and sail off into a new school year, it may also be an ideal time to set your sights on reclaiming the rooms of your home. Two of your best allies when recovering your spaces from the glut of beach toys, stuffed animals, electronic gadgets, and craft supplies left behind by the kids are the tried-and-true tactics of De-Clutter and Organize (in that order). De-Clutter: Perhaps one of the best ways to prepare for this portion of the “home salvage” project is to watch a few episodes of one of those hoarding shows, then take a good look around your own home. Think “What do we need/love” and “What is just taking up space/I never liked that”. Go room by room and make a list of what can be removed. Can it be stored elsewhere, made “like new” if moved to another room, or is it time for it to go? You could host a garage sale to fund future purchases or box the items up to make a contribution to a local charity. Once you’ve cleared the clutter, it’s time for phase 2. Organize: You could spend a fortune on storage boxes that you’ll likely rarely open or you could incorporate special forms of organization into your home décor for a fun and functional new twist. Built-in bookcases, storage benches (set around the kitchen table or under a window on the stairs), strategically planned closets, and installed office spaces all prove excellent organizational tools. There may even be space in your home that you aren’t even aware of – from an attic that could be finished to create an entirely new room to a space under the stairs that could serve as an ideal storage space. By enlisting the aid of an architect, structural engineer, and construction expert – you’re all set! Fortunately, you can find all three of those specialties rolled into one at Highlight Homes. Not only can we review your structural layout to examine all of the possibilities, we can design AND build those exciting organizational changes into your home so that they flow in with the décor and personality of your house. What are you waiting for? 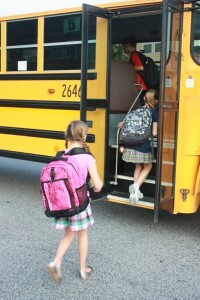 By contacting Highlight Homes TODAY, we can get started by the time the kids head back to school. Simply click HERE to fill out an online contact form, e-mail us at info@highlighthomesga.com, or call us at 678.873.9234. To learn more about Highlight Homes and sneak a peek at our virtual portfolio, we invite you to visit us online! 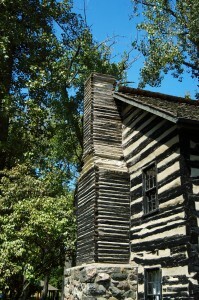 In honor of National Log Cabin Month, Highlight Homes would like to dedicate one of our July blogs to a subject near and dear to our hearts. As real “outdoorsy” folks, we love the occasional get-away to the mountains and the lake – two places where log cabins and lodges are most prevalent. As designers and builders, we are firm believers in surrounding oneself with the things you love in order to make a house a home – regardless of whether its overlooking a lake, perched high atop a mountain, or located inside a nice, quiet cul-de-sac in the suburbs. At Highlight Homes, we love to use natural elements – so creating the log cabin look and feel is a snap for our renovation design team. In homes with cathedral ceilings, the incorporation of exposed beams gives a room the relaxed yet refined sense of a mountain lodge. The same can be said of hardwood flooring and charming interior doors. As a green builder, we like to use reclaimed timber with loads of character. Stacked stone accents around columns and fireplace surrounds will also serve to enhance the Adirondack ambiance both inside and outside the home. To set up a free consultation with the design-build team at Highlight Homes to discuss ways to transform your home into something you and your family with love – from the feel of a beachside cottage to the air of a log cabin in the mountains – call us TODAY at 678-873-9234. We can also be reached via e-mail at info@highlighthomesga.com or through our convenient online contact form. 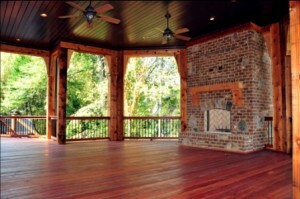 To learn more about Highlight Homes and all of our service offerings, please visit us online at www.highlighthomesga.com. Be sure to “Like” Highlight Homes on Facebook and follow us on Twitter! As far as outdoor kitchens go, you can elect to go with something simple that complements your home's style (as pictured) or something that STANDS OUT and really makes a statement. Home Depot – You’ve heard the phrase “kid in a candy store,” right? Well that’s how we feel about this big box home improvement retailer. Designed to fit the needs of both the at-home handyman and commercial construction professionals, Home Depot offers a wealth of project supplies and row-after-row of inspiration for that next great project. We’re also big fans because – just like Highlight Homes – Home Depot is a homegrown Georgia-based company. ThisOldHouse.com – What began as a home improvement TV show more than 30 years ago has grown into a multi-tiered brand that is trusted by homeowners across the nation. In addition to the show, This Old House has added a magazine, a number of books, and an incredibly informative website to its workbelt. While we believe all of their divisions are incredible tools for inspiring a great home improvement project, the website is a particularly terrific one-stop shop for great articles and idea-provoking images. Ballard’s Backroom – With two locations in Georgia – one in Roswell and the other in Atlanta – Ballard’s Backroom offers a treasure trove of amazing design elements at outlet prices from interior design powerhouse, Ballard Designs. From furniture and artwork, to chandeliers and rugs – every visit to Ballard’s Backroom can lead to an exciting new discovery that will serve to enhance your home remodel beautifully and affordably. Stayed tuned for the August edition of “Shades and Highlights” to learn about more things the talented design-build team at Highlight Homes likes. If you have suggestions for things YOU like that you feel we should check out, please let us know below in comments. Ready to start fresh and create that “blank canvas” to work within? To contact us to discuss an upcoming home remodel, we invite you to call us at 678.873.9234, e-mail us at info@highlighthomesga.com, or fill out our helpful online contact form. If you wish to learn more about us, visit us online at www.highlighthomes.com and be sure to “like us” on Facebook! 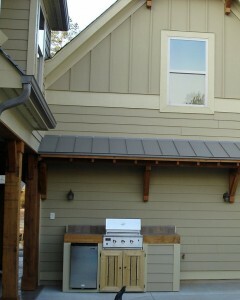 * Highlight Homes is not directly affiliated with Home Depot, ThisOldHouse.com, Ballard Designs or Sunset.com. These are merely the opinions of the design-build team at Highlight Homes. While the housing market continues to lag and many folks are warming to the idea of staying put in their current home, the ongoing issue of the need for more space persists as a recurring theme. Although temperatures are currently lingering at the high end of the temperature gauge, it won’t be long until they’re back within a cozy “backyard barbecue” zone. During Highlight Homes’ most recent renovation, the homeowners have been astounded by the growth of their entertainment options thanks to an outdoor space overhaul where a simple back deck was transformed into a luxurious open-air grand hall – complete with stacked stone fireplace. Now, they can envision countless afternoons and evenings hosting friends and family in this beautiful new space (see second inset) or simply enjoying their outdoor oasis all by themselves. Homeowners who enjoy spending their evenings catching up with friends might appreciate the concept of an outdoor living room. Deep and inviting seating add to the comfort, as do ceiling fans for those warm evenings and hearths or firepits for those cool evenings. Aspiring chefs may want to make food the centerpiece of this space with a large dining table with plenty of chairs, impressive outdoor chandelier hanging from a pergola overhead, and impressive grill kitchen with plenty of workspace for you to show off their skills. In the event that sports often play a role in your parties, a covered area that features an all-weather flat screen TV, comfy couches, and bar may be your ideal option. Those blessed with a green thumb may want their garden to be the focal point with walkways leading throughout and special spots for reflection placed here and there. The sky’s the limit to the number of things your outdoor space can become. Highlight Homes is happy to help you decide what option might be best to fit both your needs and your personality during an on-site consultation. 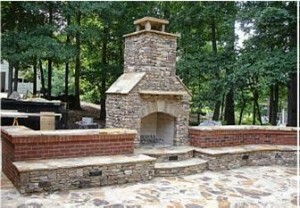 To schedule a consultation with our talented design-build team about incorporating your own custom built outdoor living space, call us TODAY at 678-873-9234, e-mail us at info@highlighthomesga.com, or fill out our helpful online contact form. To learn more about Highlight Homes and our broad range of services, we invite you to visit us online at www.highlighthomesga.com.